The heritage steam locomotives take you on a five-mile return journey alongside beautiful Llyn Padarn lake, in the heart of Snowdonia. The five-mile return trip takes around 60 minutes. 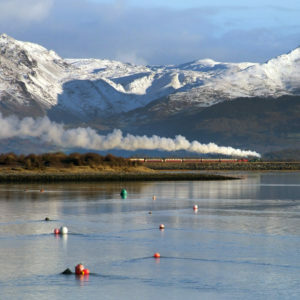 All train services are scheduled to be hauled by vintage steam locomotives rescued from the nearby Dinorwic slate quarries and lovingly restored. Starting at Gilfach Ddu, the journey takes you past the 13th-century Dolbadarn Castle, crossing the Afon y Bala, possibly Britain's shortest river, and passing between Llanberis’ twin lakes as the train negotiates the extension (opened in 2003) to Llanberis village. From here the train runs non–stop through Padarn Country Park, joining the 1845 slate railway route to run along the shores of Lake Padarn to Penllyn, and giving stunning views of Snowdon, the highest peak in England and Wales. Mid-way along the lake there’s a short stop at Cei Llydan, a beautifully tranquil lakeside picnic area. 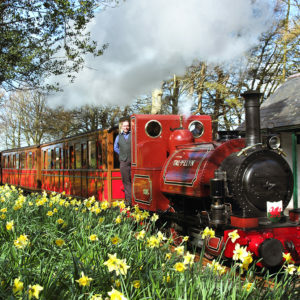 Visit Wales chose this spot as one of the country’s Top 10 places for a picnic, combining “the fun of a good old-fashioned picnic with the romance of a ride on a vintage train”. The train returns to Gilfach Ddu, where slate was transhipped from the quarry system to the slate railway. Here you can watch the driver as he fills the tanks with water and stokes the fire ready for the return journey. At Gilfach Ddu you can visit the station café for refreshments, or browse the souvenir and gift shop. 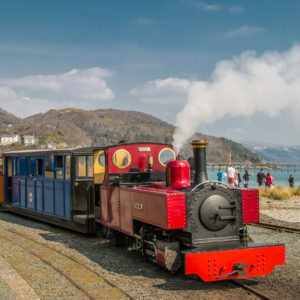 All trains are scheduled to be hauled by "Elidir", "Thomas Bach" or "Dolbadarn", our ex-quarry Hunslet steam engines, that spent the earlier part of their career working the nearby Dinorwic Quarries. There is level access to the trains at Llanberis and Gilfach Ddu stations; every train has a coach that has been specially adapted for wheelchair users. Caernarfon/Bangor and Snowdon Sherpa buses stop outside Llanberis station. Situated just off the A4086 in Llanberis. Follow the steam train or Padarn Country Park Signs. Llanberis is just 15 minutes from the A55 (Jnc 11), 20 minutes from Caernarfon, and 45 minutes from Porthmadog/Betws-y-Coed via the scenic Llanberis Pass road. There is plenty of parking in the pay and display car park, Ger y Llyn, Llanberis, operated by Gwynedd Council. This serves the railway, the slate museum and several other attractions in Padarn Country Park.